APRIL 11, 2019 – For 275 years, Faneuil Hall has been the site of meetings, protests, and debates. To this day, people continue to gather at the historic site–where Revolutionary-era meetings and protests were frequent and generations to come would meet to discuss the meaning and legacy of American liberty. There was no debate between the guests on this day as none could protest the proud tradition between Massachusetts and the U.S. Army. 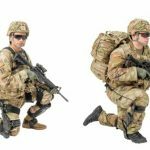 Baker mentioned the challenges that today’s Army faces including cybersecurity issues, combat, activities involving engagements with friends and enemies, and, in many cases, the equipment and technological expertise that is required for Soldiers to perform their duties. “I know that I speak for the people of Massachusetts when I talk about our great relationships, both corporate and military, from the Natick Soldier Systems Center, Northeastern University’s facility in Waltham that works with the Army, and many other examples of partnership and collaboration, including Lincoln Labs which in many respects is the crown jewel of the technological infrastructure that provides for the men and women in the armed services,” continued Baker. Brig. Gen. Vincent Malone, senior commander of the Natick Soldier Systems Center and deputy commanding general of the U.S. Army Combat Capabilities Development Command (CCDC), spoke on behalf of the active duty Army and punctuated Baker’s remarks on Army technology and innovation. Malone continued, “This week is an opportunity for our Army to get out and tell its story. In the Army, our people, our Soldiers are our greatest asset. But without the trust, confidence, and the support of the American people we cannot maintain our all-volunteer Army. The Army offers over 150 career opportunities, 50 alone in the medical field. Those in uniform know well about the comprehensive training and education opportunities the Army offers its Soldiers–99 percent have related civilian credentials, and last year alone, 6,900 Soldiers completed their degrees while serving. 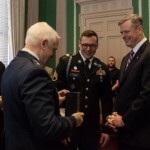 Boston’s Meet Your Army Week is a Total Army community outreach effort to connect the city’s community and its citizens with the Army they haven’t met yet, which includes active duty Soldiers, the National Guard, and the Army Reserve. Boston is home to the Military Entrance Processing Station (MEPS Boston), one of 65 in the country, where individuals are processed for enlistment or induction into the armed services. Approximately 11 thousand individuals are processed through MEPS Boston with more than five thousand of those joining the Army. The ceremony included the reading of proclamations from the Commonwealth of Massachusetts and the City of Boston declaring Apr. 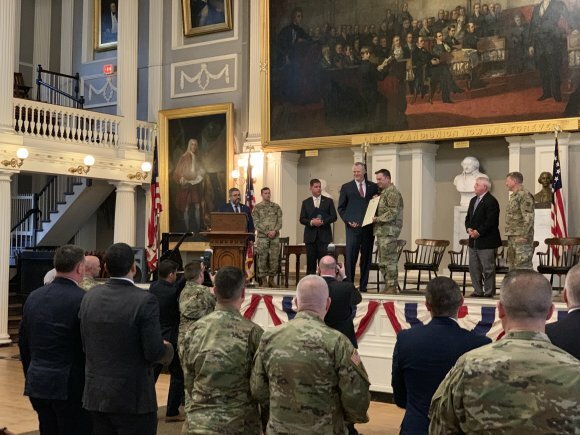 8 to 15 as Army Week and ended with the presentation of U.S. Army flags to the city and state by Maj. Gen. Gary W. Keefe, adjutant general of the Massachusetts National Guard, and Maj. Gen. Mark W. Palzer, commanding general of the 99th Readiness Division. Army Week Boston events include a cybersecurity symposium hosted by the Army Cyber Institute at West Point and Northeastern University, military research and development exhibits at Lincoln Labs at the Massachusetts Institute of Technology, an Army Futures symposium, a parachute jump demonstration by the Army Special Ops jump team, the Black Daggers, virtual reality experiences and fitness challenges, and performances by the Army Drill Team, Six String Soldiers, and 78th Army Band.